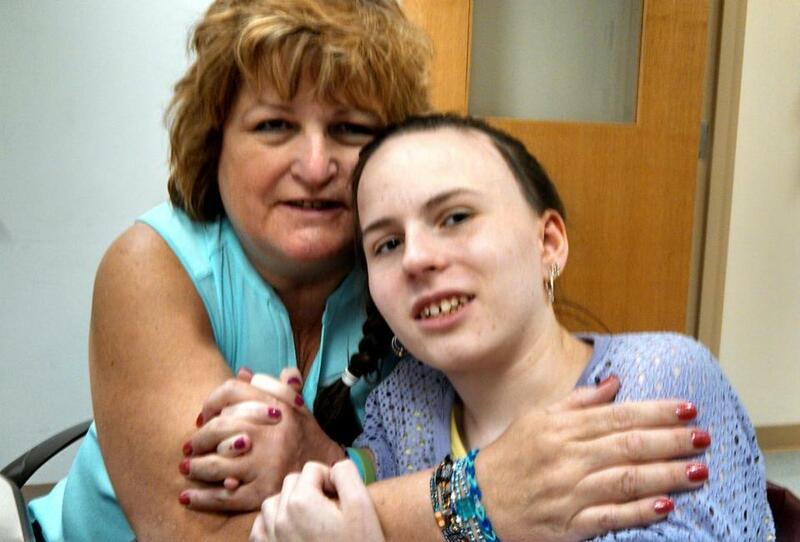 Linda Pelletier with her daughter Justina during a visit in September. Justina Pelletier, the 15-year-old Connecticut girl at the center of a searing medical and custody dispute, has been discharged from Boston Children’s Hospital, where she had been treated for nearly a year. She was moved Friday from the hospital’s locked psychiatric unit to a residential program at Wayside Youth and Family Support Network in Framingham. However, the Massachusetts Department of Children and Families has decided that Children’s doctors will continue to treat her for the time being, until the state agency settles on a new care team. The state child-welfare agency has held temporary custody of Justina since February, when her parents attempted to remove her from Children’s after doctors concluded that the teen’s symptoms, including difficulty eating and walking, were mostly psychological in origin. appointed investigator set in motion a plan to have Justina discharged from Children’s and moved to a transitional facility, with Tufts Medical Center doctors expected to assume primary oversight of her medical care, according to three sources briefed on the case. However, two of those sources said Friday that state officials are rethinking the idea that Tufts would take a leadership role in treating Justina, after at least some providers there expressed concern about getting involved in the highly contentious case. Tufts remains an option, but other hospitals are being explored. Children’s officials, while declining to discuss specifics about Justina’s case, have repeatedly stressed that the hospital does not keep patients in its care against the direction of the custodial guardian, which, for Justina, has been the child-welfare agency. “In all cases, transfer to a less restrictive setting occurs as soon as an appropriate placement setting becomes available,” the hospital said in a statement. Justina’s case has drawn national attention by exposing the often fuzzy line between psychiatric and physical illness and highlighting the growing use of the term medical child abuse, which can be attached to parents seen to be pushing for unnecessary and potentially harmful medical interventions for their child. Despite the high level of interest in the case, it is shrouded in secrecy, because of patient confidentiality restrictions and a far-reaching gag order that the judge has put in place. As is customary in juvenile court, proceedings have been closed to the public. Chester Tennyson, the lawyer for Justina’s parents, declined to comment on their behalf Friday, citing the gag order. Justina’s stay at Wayside in Framingham is intended to be temporary, though it is not clear how long it will last or where she will go after she leaves. At the very least, she is expected to remain there long enough for a thorough evaluation, to determine how she responds to her new setting and how her parents respond to the new arrangement. Records show that the parents, Linda and Lou Pelletier of West Hartford, Conn., have had numerous clashes with Justina’s providers in the past. They have been pushing to regain custody of their daughter since the state stripped them of it, on an emergency basis, last Valentine’s Day, after Children’s physicians raised suspicions of medical child abuse. Justina had arrived at Children’s just four days earlier. Previously, she had been treated for more than a year by Dr. Mark Korson, chief of metabolism at Tufts, and a team of specialists there for mitochondrial disorder, a group of genetic ailments that affect how cells produce energy, often causing problems with the gut, brain, muscles, and heart. But when Justina’s mother called last February to report that Justina was having great difficulty eating and walking, Korson directed her to Children’s so she could be seen by her long-time gastroenterologist, who had recently moved to that Harvard teaching hospital. In a matter of days, a different team at Children’s concluded that Justina’s problems were mostly psychiatric and moved to reshape her treatment plan. After her parents objected and attempted to take Justina back to Tufts, the Children’s team alerted the state. During Justina’s long hospitalization at Children’s, Korson had repeatedly requested, without success, that the hospital and DCF convene a summit of all her providers, to try to build consensus about a treatment plan that would be in her best interests. The court-appointed investigator in the case, William Cusick, has scheduled a large meeting for the end of this month, expected to include the major parties. The next court hearing will be Feb. 4. The biggest looming question is whether Justina will eventually be returned to her parents and three older sisters in West Hartford, or whether Massachusetts will decide that Justina would be better served by remaining in state custody and perhaps be moved into a foster care facility. Because the case straddles state jurisdictions, another big question is the extent to which the Connecticut Department of Children and Families will increase its involvement in the case. “Sometimes the reality is the answers are not that easy to come by,” Eagan said. Patricia Wen of the Globe staff contributed to this report. Neil Swidey can be reached at swidey@globe.com.